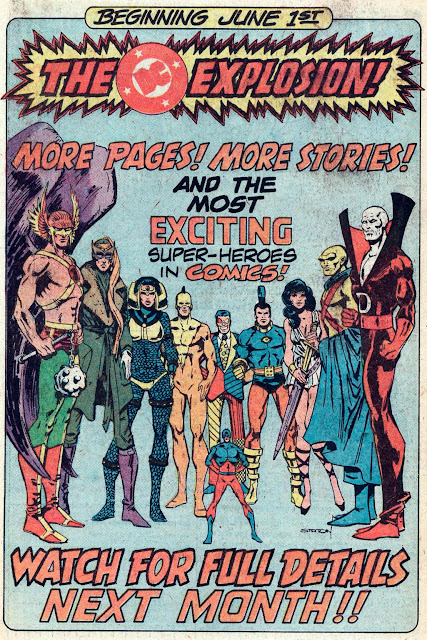 When I was a young tike, I loved coming across house ads in comics and inventing back stories, powers and situations for the characters I didn't know. It's a game that's a little hard to play today, in ads that seem to rely on icon's like Spider-Man and Batman to sell, but hey, it kept me out of trouble for five minutes, so that can only be a plus! DC to me, used more underdogs than anyone else at the time in their adverts, and while this ad is an unfair example (considering it's selling the launch of less popular characters into their own titles) at the time it was also one of the best to play with, as I only knew Hawkman, Martian Manhunter, and The Atom. People, DC wants to cancel Doom Patrol. Is tha Hippolita on the right? Sorry for using you blog for this without asking Dan. Idid the same on Dave's and didn't apologized there. Yeah, but I'm sure Dave did something to deserve it. Okay...what is the guy in the Devil costume? I know I know him and it's killing me. Getting old? I'm already there and it doesn't get any better. i don't know about Dan, but just for the record Aliera & Barb a.k.a Randomnerd can exploit me...or my blogs in any way they want to. common courtesy as a gentleman demands i bend to their will. ...as I said earlier, the man is a SAINT. I'm honored to be his wingman. so much more appropriate your profile icon is that of a robot which transforms into a jet fighter. Aliera - that's great that you're getting in behind DOOM PATROL - active positive fan action is great to see so thanks for using IADW to rally folks up! Memory loss, saints, obedience and petitions - what was the subject of this blog again? lol Just kidding folks. I love the community we've got going and logging in to see all the talk on this little post alone was awesome. Never when I first started IADW did I think it would get like this. Looking forward to seeing who else joins in the fun on the months ahead! Yes this is very fun. Random, Deadman has been pretty much alive lately on brightest Day. He's one of the most interesting characters there. ya know i've been trying to drill this into people's heads for a while now. even great blog sites like Dan's wouldn't be as enjoyable with out all the banter. to me that makes all the difference in having a blog in the first place. i'd rather have just five people look at a posting who leave comments (good or bad) then know that five hundred people looked at it but didn't bother to say anything. i met Randomnerd on Facebook many months ago and believe it or not i had to coax her into leaving comments on my blogs. then by the time i introduced her to IADW she was all over it with comments. we commentators are making the world a better place one blog at a time. I'm just glad there's finally a use for being a chronic smartass. I was starting to feel like I wasn't living up to my full potential. And that would be a shame, she says on a formal voice. Yeah, it's nice to find another with such sense of humor. Well Craig we also did get you buying comics again so I'd say reaching your potential was only the beginning - now you have that thirst for Wednesdays again! I completely agree with you Dave - couldn't have said it better myself. I love the chronic smart-assedness Craig. It's one of the reasons I tune in. I love reading what all of you write. You're a wonderful group of people and I'm very happy to have found all of you. And I'm grateful to Dave from dragging me into it. And to my friend for pointing me to Dave's blog in the first place. And for me reading all the fun makes me more inspired to do postings - running a one man band can be hard job sometimes and while I know not every post is gonna generate a comment having awesome chats fall where they do acts as pay off for the whole shebang! Anyone know who the woman in white on the right is? Looks like non-powered Diana, maybe a backup for Wonder Woman, but I can't find any kind of list detailing where all the characters were supposed to be appearing/identifying them. Thanks. Hey Robert - Thanks for the comments! At first I thought that was Starfire (http://lastshortbox.blogspot.co.nz/2006/04/from-three-for-dollar-box.html) from the fantasy range the explosion offered, but as the Captain Marvel TV show was big at the time, I think that is most likely Isis, who's own short lived series was part of the comic-television section of the Explosion (http://www.comicvine.com/isis/4050-2840/).